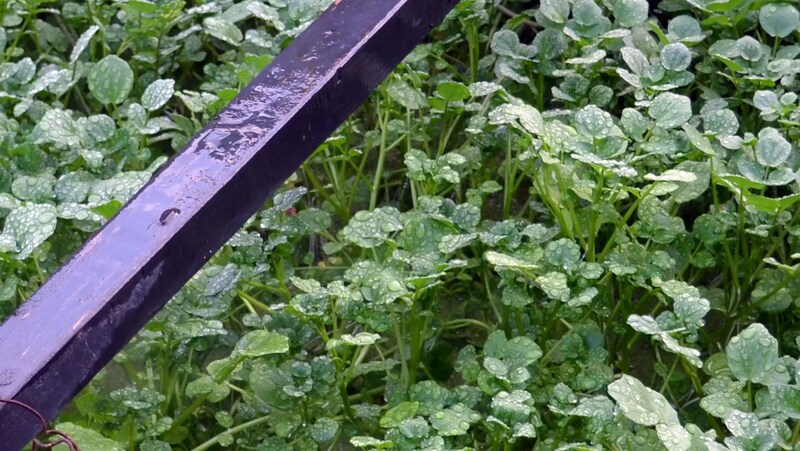 As with many experiments that occur behind the fence here, my watercress scheme was quietly fizzling offline and out of view. A post announcing it here on May 29 and a tweak posted here on July 1 had beem the extent of my reporting so far. The shade cloth cover noted in the July follow up post certainly helped with the algae, but probably only indirectly. You see, even though the heat and transplant shock did a number on my “stolen” starter watercress plants, the modest shade allowed another interloper to thrive: Duckweed. For those are familiar, it will come as no surprise that if conditions are right for duckweed, well, every square inch of surface will be coated in the tiny leaves. If not, a fleck or two will exist if you look hard enough, but there really is nothing in between. This has some benefits though; an uninterrupted duckweed surface coating gains a monopoly on sunshine vs anything underneath, so the algae is choked out. 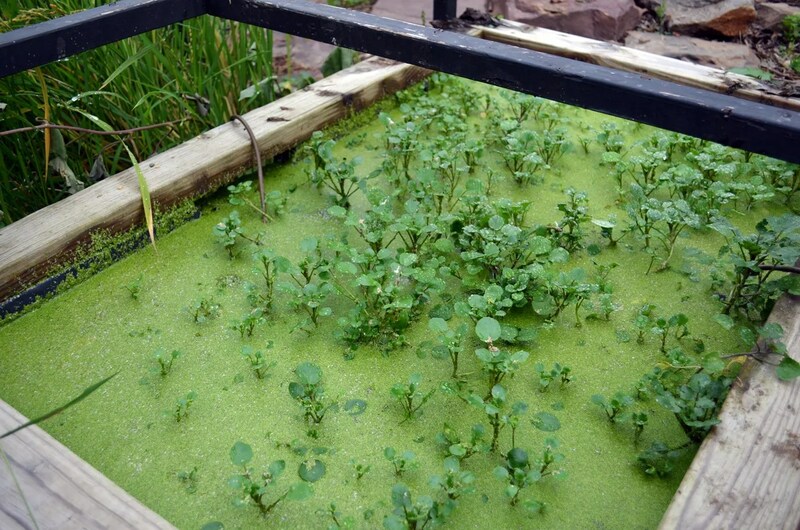 On September 25, when I decided it was cool enough to remove the shade cloth cover, this is how my duckweed, er…. I mean watercress plot looked. Although the duckweed looks as solid as a patch of moss on a clay base, it is floating peacefully on an inch or two of fresh well water being misted into the bed. The watercress is there, with a few tough survivors poking through the surface and absorbing just enough sunlight to survive the less that ideal summer conditions I created. Fast forward a couple or three weeks to October 17 and the ratio seems to have reversed. 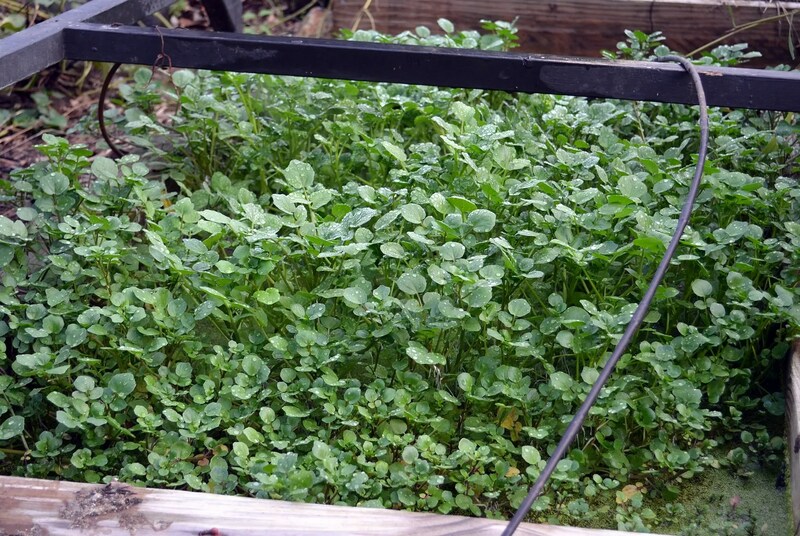 The watercress has exploded and the duckweed, while still there, is submissively co-habitating beneath a mini-canopy of tender cress leaves. Cooler nights and days with the less intense and more angled autumn sun seem to be suiting the cress just fine don’t you think? We’ve enjoyed a good bit of harvest in the last week or two following this surprise rally; under current conditions it replenishes itself almost a fast as we can cut it. As is usually the case, this shows again that the best way to learn about growing things is to actually try to grow, not confining yourself to what the books advise. You know, the title makes this sound like an episode of Iron Chef, but the food is fighting instead of the chefs.